Western blot analysis of whole cell lysates probed with CD146 antibody (VMA00201) followed by detection with HRP conjugated Goat anti Mouse IgG (1/10,000, STAR207P) and visualized on the ChemiDoc™ MP with 22 second exposure. Arrow points to CD146 (molecular weight 120 kDa). CD146 antibody recognizes cell surface glycoprotein MUC18, also known as Gicerin, S-endo 1 endothelial-associated antigen, cell surface glycoprotein P1H12, melanoma adhesion molecule or melanoma-associated antigen A32. Mouse anti Human CD146 antibody recognizes CD146, also known as gicerin, S-endo 1 endothelial-associated antigen, cell surface glycoprotein MUC18, cell surface glycoprotein P1H12, melanoma adhesion molecule, melanoma-associated antigen A32 and melanoma-associated antigen MUC18. 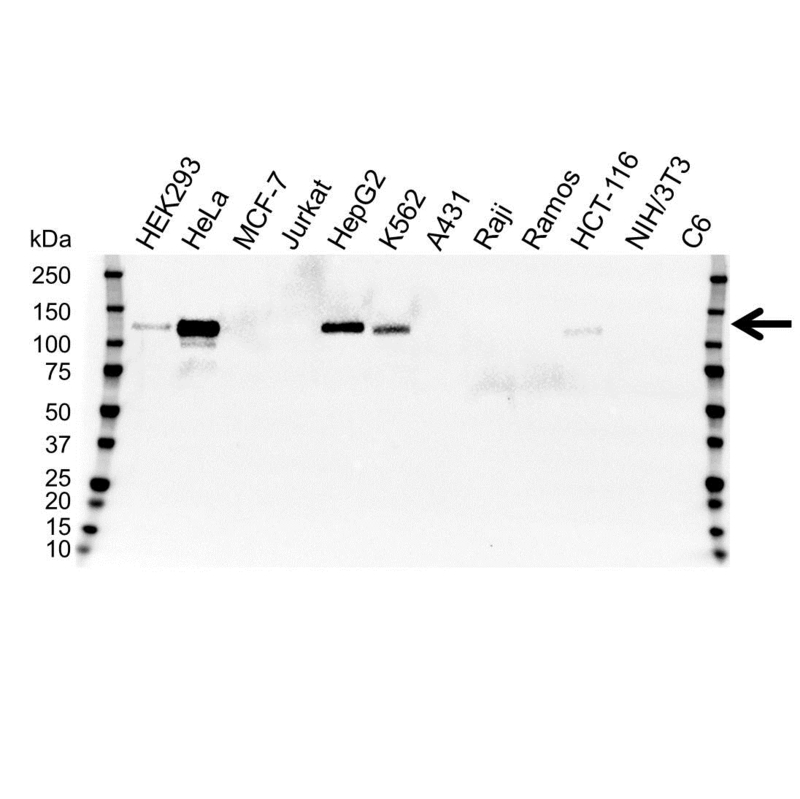 Mouse anti Human CD146 antibody detects a band of 120 kDa. The antibody has been extensively validated for western blotting using whole cell lysates. Anti CD146 detects a band of approximately 120 kDa in HeLa cell lysates.